Jesus Himself demonstrated how to defeat the devil. Don’t you find it very significant that the very first teaching in the very first book of the New Testament is a demonstration by Jesus on how to defeat the devil? I think it’s very significant. It’s no surprise to me to realize that the first thing Jesus taught as He began his public ministry was a lesson on how to defeat the devil. This is the first of about 250 references to Satan and his demons in the New Testament. Clearly, this is a critically important topic! See how He demonstrated how to defeat the devil? Each time the devil tried to tempt Jesus, He responded by quoting Scripture. I urge you to look up these Scriptures in your Bible. Underline them, write them on recipe cards, and memorize them. In God’s economy, Truth is ALWAYS stronger that lies. The power for how to defeat the devil is not in the speaker; it’s in the SPOKEN WORD! The devil can’t tell the difference between Jesus speaking and a Christian speaking. According to Jesus (See Luke 10:16 above), when you or I speak God’s Word, it’s actually Him speaking through our vocal cords. In those moments, as members of the Body of Christ, our voices becomes His voice! And He has put great power into His Word! So, Is This Available To Everyone? Yes, ANYONE can have it, but the cost is: YOU! Your surrendered life. With Jesus, it’s all about us forming a relationship with Him. And not everyone wants to do that. If people knew what they were missing, they would go for it 100 percent! Love God… with all your heart, soul, mind, strength. Do you see how that just shouts “relationship”? Also, I found 20 Scriptures wherein Jesus directed people with the words, “Follow Me.” As I said earlier, it’s all about having a close relationship with Jesus. But the thing about being “yoked” to someone is: where one goes, the other goes. He wants each of us to become one of his disciples. He wants to “sanctify” us (transform us into one of His) and use us for His purposes. Along with that, there are certain benefits. One of them is divine protection from the devil. Jesus has the devil on a leash. He can go so far… but no further. This is all about us partnering with God. There is a part that we can do, and there is a part that only God can do. But until we do the part that we can do, God will not do the part that only He can do. Submit to God. Obey Him. That’s the part you can and must do first. Resist the devil. As God’s obedient disciple, His power operates through you. Sadly, most people ignore the first part, and try to figure out how to defeat the devil by their own strength. But they can’t do it. God promises to “rebuke the devourer for you”. That’s an offer to restrain the devil (he’s the devourer — see 1 Peter 5:8 ) from destroying the “fruits” of your labor. But notice: that offer comes AFTER His commanded to “Bring the full tithe into the storehouse”. That’s a command to practice biblical stewardship with your money. The offer is conditional. Ultimately, it all belongs to God. He calls you to take a step of faith and give the first 10 percent of your income back to Him. And having established that condition, God must, as it were, play by His own rules. So if you don’t do your part first, well… you see my point. Jesus Gives Power And Authority To Those Who Are Truly His Disciples. If you are a disciple of Jesus, you have power over the devil. But as I’ve been saying, there are certain characteristics you will exhibit, if you are truly His disciple. We need God’s Grace, which the Amplified Bible defines as “power of the Holy Spirit”. But grace only goes to those “who are humble enough to receive it.” Humility, then, is also a characteristic of a disciple. So then, who actually defeats the devil? Clearly, it‘s God who not only knows how to defeat the devil, but also has the power to do it. Here too, it‘s the Father whom Jesus is asking to handle the devil. Evil (the devil) is being blocked by whom? Once again, it‘s God doing the heavy lifting. Can you see the relationship implied there? As I said earlier, God wants to have a relationship with you. He wants you to get to know Him. And you get to know God the same way you got to know any other person: by what He says and what He does. Where can you go to find out what God said and did? That‘s what the Bible is all about. He wrote it. Everything He wants you to know about Himself is in there. everyone who has been born of God... These are Christians who have been "born of God". He who was born of God... This is Jesus Himself protecting us from the evil one. Even Michael the archangel, as powerful as he is, found it best to call upon God to rebuke Satan. As I was reciting Psalm 23 during an early morning Scripture memory session, this phrase stood out as never before. I realized I had just found yet another example of God providing His protecion from the "wicked forces of evil" to those who abide in His Word. Someone has said that there are 3,900 Scripture passages commanding us to know His Word. Yet I keep encountering people who tell me they cannot memorize Bible verses. If you’d have asked me to recite so much as one verse 20 years ago, I doubt that I could have done it. So I sympathize with those who have done no Scripture memory. I used to be one of you. Now, I can’t get enough of Scripture! What happened to lift me out of my ignorance? I listened to Bible teachers on the radio a lot, often while doing chores. I began to see how practical the Word of God is, and I wanted more. Now I cannot imagine how I ever lived without God’s Word at the center of my life. I wasn’t sure what it meant that Jesus would “manifest” himself to someone, so I looked it up. It means He will reveal Himself to the person. BAM!! In a flash of recognition, I realized: that’s what was happening to me, right here in an upstairs room of my house! Jesus was revealing Himself to me through the passages I was reading each morning. It was a real presence! He was right there. Not visibly, but He was — and is — right there with me! There’s no way I could ever go back to where I was before. David wrote, “More to be desired are (the Words of God) than… much fine gold”. See it there, in verse 10? I can honestly say this: If someone were to offer me, say, a thousand TONS of gold–but they would simultaneously erase all memory of God and His Word from my mind, there’s no way I would accept that offer! I Googled “current price of gold” and found that, as I write this, gold is trading for $1341 per ounce. So check my math here: 1 pound = 16 ounces, right? Two thousand pounds = 1 ton, = 32,000 ounces. At the current price, that’s $42,912,000. Almost 43 million dollars, for one ton. But I said what if the offer was a THOUSAND TONS! That would make it nearly $43 BILLION! Right: Billion with a “B”. But they would erase all memory of God and His Word from my mind. I’m saying: — not “no”, but “HELL NO! !” Because hell is where I’d be going. Why? Because here’s what I know: to live without God in this life results in living without Him in eternity. There is nothing this world has to offer that can match the value of the Word of God. The person who ignores the Word of God in life will be rejected by the God of the Word in eternity. Do you want to know how to defeat the devil? Simple: just read through a bunch of Scriptures like that one every morning. That’s what I do, every day. Like an arrow released by an archer, this simple practice of Scripture memory every morning sets the trajectory for my whole day. My mind is so saturated with the Word of God, the devil can’t get a word in edgewise! Rejoice — renew, refresh, refill, replenish — with JOY! Not happiness, which rises and falls with circumstances, but JOY which is always maxed out! Because it’s in the Lord. Joy is in the Lord. I said, JOY IS IN THE LORD!! ALWAYS!! And the Lord is at hand — He’s RIGHT HERE WITH ME RIGHT NOW! Because of that, I am anxious for NOTHING! I thank Him and Praise Him throughout each day. “And the peace of God, which surpasses all understanding…” I have it. I HAVE IT! He’s given it to me. To ME! I have it! His peace is guarding my heart and mind RIGHT NOW! Do you want that? You can have it. Your battle with the devil is taking place in your mind. How to defeat the devil? By speaking the Truth of God’s Word! And the more Scripture you know, the more power you have, because the power of God is in His Word. So, how are you doing at internalizing God’s Word? I’d love to help you with that, too. Really, memorizing God’s Word is not at all like when they made you memorize seemingly useless stuff in school. Here’s A Free Scripture Page To Help You Get Started! To open this PDF in a separate window, CLICK HERE ? Fold the printed page in half vertically, right down the middle. Holding it vertically, fold the bottom edge up to the faint line that you see right on the fold, about a third of the way down from the top. Do the same with the other end; fold it to the other faint line. 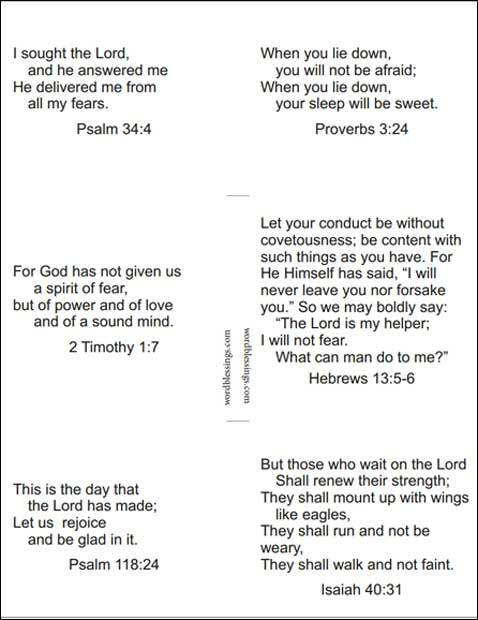 Now you have a 6-panel set of helpful verses that you can tuck into a pocket or purse. Take it out several times a day and read through those 6 Scriptures. The best biblical article I have ever read my entire life. I have read so many books and articles looking for Jesus but was never satisfied. I have been read about spiritual warfare and prayed all kinds of prayer but still no peace. But when I read this, I am satisfied and there is the presence of God in my heart that I have been yearning for. As a matter of fact, when I was reading this article, I had a terrible headache and then I said ” Satan, it written by His stripes I am healed and so I am healed of this head ache” and within 15 minutes, the headache was gone. God bless you for this teaching and I have been set free. The word of God keeps me going each and everyday of my life…..and this website has encouraged me to put my trust in the Lord. Thank you for breaking open the Word to the extend that I fully understand. It feeds my soul and I feel strengthened and encouraged. WoW! God lead me straight to this. I have the same attacks at night. Fear, dread, panic. I am now facing a little health issue but God is my healer. Thank you so much for sharing this it is very encouraging. Please Pray for me. Thank you so much. God bless you! I’m glad you made it through. Mary, you said it very well: God is more real — and He is infinitely more powerful, and He is on your side. Satan and his demons have no power over you. Their while game is deception. Thank you for the encouraging verses. I have taken your advice of having more time for reading the Bible and meditate upon them. Am now 30 years and I have been attacked by evil spirits several times but God delivers me. I have been asking myself on how to come out of this and be set free indeed not to be attacked again. thank you am going to put into practice what God has made you advise me to do. its my first time to think of searching from the internet on how to defeat the devil. my greatest enemy. Be blessed in the name of Jesus the Lord . How wonderful to read your report, kensita. Praise God for Google searches! But as I say, all he can do is roar. Sounds scary, but God has him on a leash. Use God’s Word as your weapon against the fevil. Would like to purchase your books Be Gone Satan For It Is Written, and How to Defeat The Devil please let me know where I can buy them. In the article, I quoted a long passage from the Gospel of Matthew wherein Jesus said to the devil, “Be gone, Satan! For it is written”. Hi Jan thank you.And thank theLord for his everlasting promises.May the Lord bless you all. I’m glad I stumbled on you. Was preparing my sunday teaching abt fear. Then i decided to google and am really blessed. I have learnt a lot hoping to share with the church on Sunday. God bless you Jan.
Tabitha, this is the kind of thing that is supposed to happen: you read it and were blessed by it. Now you intend to share it with others. I have one request: please share my website address with your church family. Thanks! I enjoy reading the Bible and doing my scriptures and learning a lot of different things in the Bible and what is happening through this world and I like to just look around in the Bible and get aquainted . I am a new infantry being tested in a battle field. I am not worthy of his grace but he is a good father and he chose me. Thank you! Samuel, the truth is: none of us are worthy. But He loves us anyway. After all, He created us. Hello , my name is Tamaerra . I’m 14 years old and I have a story that just happened to me . Is storming outside the clouds are moving on Down the sky’s where Iam . And so I’m a little frightened with storms . So I go and check my weather but I knew I shouldn’t have clicked off of this web page but I said to myself I’m Just checking the Weather what’s the worst that can happen ? Right . So before I start to check the Weather I was writing a comment before I clicked off saying o How I love the Lord . Jesus Christ and God Himself and how I’m Going to try and make a Better relationship with the lord . So I wasn’t done writing but that is what I had . So I click off to check the weather and checked does it supposed to be storming . I tried to get back on this webpage I had Ready for me to continue with my comment . SATAN deleted my webpage I had of this ! I Told him to flee for it Is written . Him and his demons back to hell I sent them . I love Jesus Christ . I love God . They are my life I love them with everything in my Teenage body . I will forever Be a Christian . I will never bow down to Satan Or His demons . I will Forever worship Jesus Christ . And God . Before I dance I Read a scriputure . I just love them with all my heart . I just want SATAN to leave Me and my family alone forever . That’s why Iam On this mission to defeat him and his demons with my GOD . Tamaerra, that is such a great story. I hope the things you said will encourage others. victory is coming to my door step Satan have followed my life for ten years I went thru pains and sorrow even my marriage was attacked I pray that God to bless you more and more and be lifted up for conveying such a massage of God stay blessed I’m from S.A. This was just wonderful. I am a new Christian and because of reading these wonderful articles, I am on my way:) Thank you for you excellent work. Thanks Jan – I very much appreciated your insights. When you said that a thousand tons of gold wouldn’t be enough to take God from you – I could relate. I remember thinking the exact same thing when i was in my 20’s – but sadly I have not found my way back there. Hi, Steve. I really like what you wrote about deception. And that same kind of deception is going on in the world today… even in churches. People don’t see it because the don’t want it to be true. I’ve always believed in God. I am not perfect, I’ve sinned like anyone else and I have a lot of faults. My life as far back as I can remember to now @ 54 years has been hard, unfair, ugly, and I have lost a lot in life and I question God why, why me? I truly believe what took place during my childhood scarred me for life and all the bad that could happen to a person, just fell in place like dominos. Was that the Devil? I think so. I go to church and Sunday school and I have a private prayer life. I guess I’m going at it all wrong, not walking in Gods word 100%. I have been in a situation for a while now and it has begun to take its toll on me. I have given it to God. Recently, I thought my prayers have been answered, I thought God has opened that door for me to step through and receive his blessings, unfortunately that was not the case and I came to a conclusion that it’s just the Devil, playing tricks on me, he’s trying his best to make me think there is no God. Because, part of my prayer is something I really want, need, and desire. I know that God knows my heart. And it makes me upset that the Devil will not leave me alone!. I truly believe that the Devil was and still is tempting me like he did with Christ, because I don’t have that blessing, I’m still in that same situation. Three separate times I thought God was answering my prayers. And three times the disappointment. I know it’s the Devil! I don’t know what my purpose in life is? Why am I here? Why is life so hard for me? Why can’t I receive God’s Blessings? Why is it so hard to be at peace, be joyful, not have control over fear and not be angry or upset? I think about what’s going to happen if I don’t ever find God the way you and other Christens have before my time is up, you know before death? When I found this article on line, it has shed some light on some of my questions. I am going to try and read scripture everyday even if I don’t understand it fully, I know God is at work with me some how some way, I can feel it. I just pray to God our Heavenly Father, in Christ’s name, that he shows me what I need to be shown, gives me the understanding, and answers to my prayers. I can’t tithe, due to not having any employment. That’s the door I thought God was opening up for me and nothing but a tease from the devil was there! The job that I desire and have been wanting has been offered to me three times already but has never come to pass. I have even settled for something less, applied to jobs that I know I can and will do even if I don’t want that type of employment, unfortunately, I can’t even receive that! I can go on and on but I think it’s best I don’t…Thank you for this article. May God Bless You Always! The Scripture memory page is back. This site was hacked badly in December (12/2015) and some things got deleted. But I’ve gotten much of it back online. Good day. I happen to be a child of God but of late especially in the 2 past years, i have been horrible. I had taken up womanizing at an alarming rate, thank God i was transferred to some town where long days tours are restricted. I had overnight overgrown with lust for women after 20 years of marriage imagine!! Thank God he exposed me to my wife through un deleted SMS that come from one of my many out side my marriage. That seem to be a turning point for me back to the Lord and be great friends with my wife. I promise my God to be faithful to his word and teaching. Your teachings Jan are amazing for my transformation through your word of the the Lord. Keep up with your terrific works, God bless you all the time. The devil keeps doing stuff to my head, and he keeps screwing with my sanity please help. I keep trying to push him away but I have awful nightmares, that are becoming more lucid every night. Jesus I pray upon you to deliver me from the awful demons in my room while I’m astral projecting, they keep screwing with my sanity, Its driving me LITERALLY INSANE, and most of them I was able to defeat on my own, but I don’t know how to remove a select few that have managed to survive in my room due to me not being able to fully expunge them with my Astral abilities, I may have crippled them between a minor to severe level depending on how strong they are, but they somehow managed to survive. Please Jesus I call upon you to expunge the rest of the demons in my room that have been causing my life problems and casualties in the past, and to send them somewhere where they can’t harm my life any further. In Jesus’s most Holy and Blessed name Amen! Amazing how the Spirit of God uses us to fish souls for Christ. I have been giving spiritual talks on “How To Defeat The Devil” and jokingly typed this title for Internet search when I landed on the same topic on your website. I have wonderful Power Point slides of my own to share with all people on any forum. If you are interested I will email them to you to put on your website. I agree with you, George, about how God uses us to, as you said, “fish souls for Christ”. I would be interested to see the slides you mentioned. Thank you so much for the wisdom you’ve shared on this site. I was searching Google for an answer about a question I had and stumbling on your website was by divine orchestration. I have heard loads of sermons about studying the word but it never really hit home. As I read your articles it’s like peices to a jigsaw puzzle came together, now suddenly it all makes sense. May God bless you and increase your influence so more people can get your message. Also, I totally agree about the jigsaw puzzle. We have a million pieces, but no box-top to see what the picture is supposed to look like. But as we are able to fit more and more pieces together, we begin to “get it”. and see the “picture” God wanted us to see. Me semi-randomly coming to this page, just shows me that God is for me! I have been struggling greatly with this lately, but now I am going to commit myself to the study, meditation, and memorization of the word. God is great! Praise him. Right on, Gus! It’s gotta be true that God is somehow leading to these articles. Who would know better than God where to find the help each person needs? Thank you so much for your site. I’m going through at the moment and am in a spiritual warfare. I’ve heard 3 sermons in a row that said to study and meditate in the word and then one day recently I was googling and looking for an answer to something and I came to your site. You and your writings are God sent! I truly thank God for you! I’m now on my journey to fill my mind and heart full of the Truth, God’s word. I have the victory today, the bible say so! September, thank you in return for sharing your story. I pray that God will continue to strengthen you as He brings you through the trials you are in. It’s humbling to me to read how something I wrote down has helped you. And isn’t it interesting how God is using Google to connect people? But having said that, I keep wondering: where are the churches? Why do people have to go to Google to find out how to get victory over the devil?? Abraham, I’m glad you found this helpful. Now be sure to spend regular time reading your Bible and letting God’s Word help to shape your life. Thank you so much. You’ve blessed my soul with these write ups. May God enrich your knowledge. Lola, thanks for taking a moment to comment. I’m glad you have found help from my blog. I want to tell you how thankful I am to have read your post on how to defeat the devil. This entire site is awesome! This has been a powerful blessing to me! I feel so blessed and encouraged in the Lord! Dorjawn, thank you for your kind words. Thanks for taking time to write a comment. And did you know… your words will be an encouragement to others. This is very helpful. Especially coming from a wonderful individuals who has been through experiences that can leave the avarage person confused. Thank you very much! Thank you, Brenda, for those very kind words. I hope things are going well for you. I am a Christian but I did not grow up as one. Since coming to the Lord in 2001, and going through many trials I am so happy to have found your website. Every thing you have written is God’s truth and your style of writing (a gift from God) has encouraged me to activate a new chapter in my life. I love how you simplified memorizing bible verses and by doing these steps my heart can really have a more intimate relationship with Jesus and I can have HIS peace knowing that HE is in control of every situation. By speaking HIS Word out loud and having it deep in my heart through saying it over and over again I can move forward in my life knowing that God has my back no matter what! By choosing to memorize scripture and making this a healthy habit everyday I can start having freedom in and through HIM. I want my life to be filled with all the blessings HE has for me and I want to pay it forward. Jan, I am so grateful and honoured to have read your website. Thank you and continued blessings for you, Joanne and for your children. Nothing holds more true than having a Saviour like Jesus Christ, Amen! P.S. Since you liked this article, why not forward it to friends? You’ll be helping to spread the Gospel. Just copy the excerpt in the green box above. The “read more” link will take your friends right to this article. Thanks!